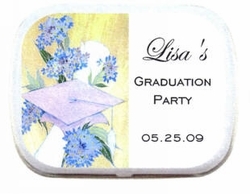 Personalized Graduation Mint Tin Favors are a fun way to celebrate your Grad! Beautifully designed Mint Tin is perfect for the sweet girl grad in your life. Each tin is decorated with a hat, scroll and feminine flowers. Alongside the pretty image we offer 3 lines of personalization. Choose your tin size, favorite candy choice and mint tin color.